World Snooker Championship Day 4 - Ronnie O'Sullivan beaten Peter Ebdon by 10-4 to advance to the second round. 'The Rocket' had a new haircut today to continue the challenge from Ebdon. 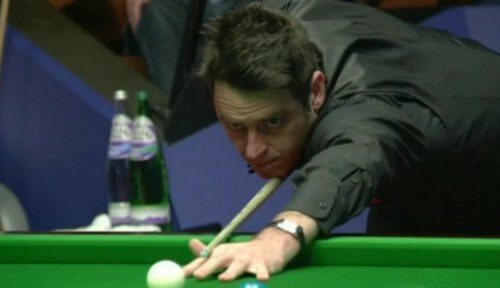 Ronnie led Ebdon by 7-2 before the second session kicked off, requiring just three more frames to win. 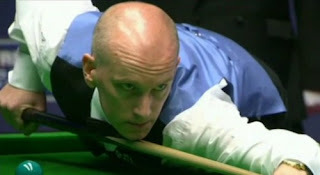 He opened with a break of 80 but Ebdon won the two frames out of the coming three to keep his hope alive. Ebdon trailed Ronnie by 4-9 at mid interval. He added, "All credit to Peter, he's a top player and winner of our last tournament out in China, I knew it was going to be tough, that's what I got." Ebdon praised his opponent, "Even though he didn't play that well in that match there were four or five occasions of just sheer brilliance and inspiration, he's just fantastic to watch." Former World Champion Graeme Dott, who has a good record at the Crucible trailed Joe Perry by 1-8 at the end of first session. Dott had no way turning back in the second session with 'nightmare snooker form', eventually being crushed out in the first round by 10-1. This is the biggest defeat in the first round so far in this year's championship. Andrew Higginson is the third Welshman to pass the first round after beating Stephen Lee by 10-6. Having a 5-4 narrow advantage over Lee overnight, Higginson won five frames he needed with Lee only scoring two frames today including a ton of 102. This is his first victory at the Crucible, and he will play fellow countryman Jamie Jones next. Judd Trump led Dominic Dale by 5-4 after first session as he got food poisoning in the morning and playing not well. Ding Junhui trailed Ryan Day by 4-5. Mark Selby struggling against Barry Hawkins, falling 3-6 behind the Snooker Shoot-Out Champion.